In the world, there are the deaf community which live in the silent life and shared with the hearing people.. they are not just being deprived of music, a sweet whisper and a simple phone call. They are also lacking the ability to be fairly warned of impending danger from out of sight sources. Designers Kwang-seok Jeong, Min-hee Kim and Hyun-joong Kim really have a great idea to created this inspired design, so it would most certainly save deaf's lives. Vibering is created to enable deaf people to sense noises that are emitted in the rear. It is almost impossible for the hearing-impaired to detect noises behind themselves and beyond their sight. For example, they fail to take notice of a vehicle's horn somewhere at the back or a friend's alarming cry; this often results in an exposure of unforeseen emergencies. 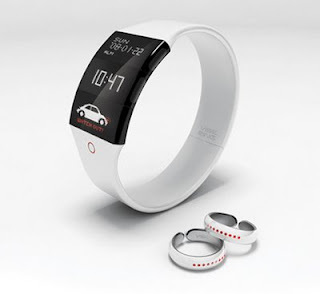 Vibering consists of two rings and a wristwatch. The ring enables the bearer to feel its vibration when there are any specific noises at the rear. The noise-detective signal of the ring is set to identify precise information from the wristwatch window at the same time.